The Durban University of Technology (DUT) Management and the three labour unions reached an agreement over salary increments on Wednesday, 05 December 2018 in Durban. 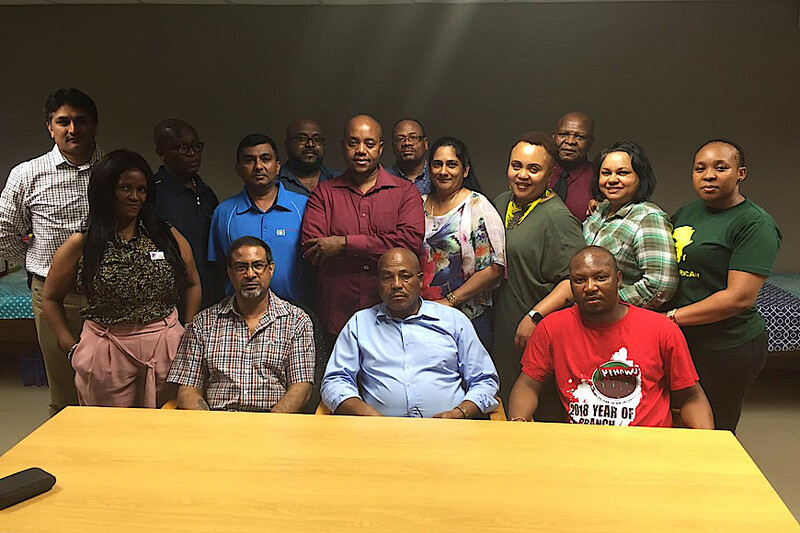 The labour unions, NEHAWU, TENUSA and NTEU all agreed on the three-year multi-year offer presented by management. This agreement follows negotiations by both parties. The agreement is broken down into three years, and year one will see an across board basic salary increase of 7%, housing allowance increase of R300 both with effect from 01 January 2019, and they also agreed on leave encashment for two weeks which is payable in December 2018. Year two entails a 6.5% or Consumer Price Index (CPI) plus 1 (whichever is higher) increase on the basic salary and R104 or CPI plus 1 Rand Value (Whichever is higher) increase per month across the board for 2020, with effect from 01 January 2020. Year three will feature a 6.5% or Consumer Price Index (CPI) plus 1 (whichever is higher) increase on the basic salary and R111 or CPI plus 1 Rand Value (Whichever is higher) increase per month across the board for 2021, with effect from 01 January 2021. Pictured: Representatives of the three labour unions at DUT and the DUT Management after the signing of the three-year increment agreement.